With omni-channel, mobile, online competition, and other forces at play, retail is in a state of dynamic transformation. Item-level RFID is playing a role in that transformation and major retailers are starting to adopt it in a big way. Retail is going through huge transformative changes. Retailers, who are typically cautious about technology spending, are taking bold steps, catalyzed by the need to provide full omni-channel integration, a differentiated customer experience, and improved margins. These are enabled by new technology developments in cloud solutions, wireless, mobile, payment, in-store technologies, and RFID. The Retail Revolution is Here—How RFID enables many of retail’s current primary initiatives. From Source to Store—The Power of End-to-End—Use cases for RFID across the retail chain. End-to-End RFID Implementation Examples in Retail—Two mini-case studies. Selecting and Creating the Right Foundation—What you need to know about implementers, solution providers, and solutions architecture. Appendix A: Criteria for Selecting a Solution—Detailed criteria for selecting a solution. Download a copy of the full report here: The Explosion of Retail Item-Level RFID: a Foundation for the Retail Revolution. In this article, we look at how retail is being transformed, the role item-level RFID is playing, and why major initiatives are underway by many of the world’s largest and most respected retailers. The likes of Walmart, Macy’s, JCPenney, Marks & Spencer, American Apparel, and others are finally implementing item-level RFID in a big way. Macy’s announced that all ‘size-intensive replenishment’ items are being tagged, representing about 30% of their total annual sales. Marks & Spencer is tagging all apparel and home goods products at all of its stores. American Apparel is rolling out RFID to all of their stores. JCP is using RFID with about 35% of their merchandise. One high-fashion retailer is rolling out RFID on 100% of their merchandise at all its retail locations and DCs worldwide. And many smaller retailers are implementing very creative uses of RFID. Last year, well over one billion apparel items were tagged. That number is expected to rise substantially this year. The benefits of RFID have been known for years, so why the big surge in retail recently? Certainly the prices of tags and readers came down dramatically from where they were 10 years ago. But perhaps even more importantly, pilots have been conducted, lessons have been learned, solutions have matured, and a body of expertise has been built up. The experience gained with RFID has enabled some solution providers to make quantum leaps in performance, reliability, and implementability. It has enabled retailers and brand companies to understand where and how to use the technology to really make a difference, gaining benefits and ROI. Retailers are using RFID to transform specific processes in a big way to achieve their strategic objectives. Most retailers use product-level data (UPC – which tells you which product, but not which individual item) for product identification and pallet or case-level data for logistics. Item level barcode data is usually only read at the origin (manufacturer) and the end of the journey (point-of-sale), but rarely in between. Instead, pallet and case barcodes are read at the handoff points during the journey, with the assumption that the items that are supposed to be in them are there. It is not economical to unpack cases and read item-level barcodes during the journey. Furthermore, barcode reading, whether item-, case-, or pallet-level, is done manually,1 one label at a time. With item-level RFID, the manufacturer and retailer have visibility to each unique item throughout its end-to-end journey. This visibility can be provided automatically as goods are loaded and unloaded on vehicles, traveling on a conveyor belt, put on or taken off of shelves, or other movements through the chain and the store (see Figure 1 below). The result is dramatic reduction or elimination of the labor required to capture data, increased data accuracy, and item-level granularity at many more points in the process. The implications are profound. It is this pervasive and granular item-level visibility from RFID that enables many of the transformative capabilities in the retail revolution. To survive in 2013 and beyond, retailers need to make it easy for consumers to buy anywhere, receive anywhere, and return anywhere. The key to this cross-channel order promising is the ability, in real-time, to locate and allocate available inventory from any location, whether in the store, in DCs, in transit, or on order from the manufacturer. This requires having a very accurate, real-time, item-level picture of inventory at all these sources. RFID has proven to improve perpetual inventory accuracy in stores dramatically, by 20%-30%. JC Penney improved perpetual inventory accuracy from 75% to 99% in categories using RFID. RFID has been shown to reduce out-of-stocks by 20%-30%, thereby increasing sales by 1%-2%.2 By improving promotion execution, RFID can increase the revenues from promotions by 10%-18%.3 Furthermore, customer loyalty is improved when shoppers consistently find what they are looking for in stock. The improved inventory accuracy of RFID also lowers the need for markdowns. Sales associates spend less time managing stock and more time providing service to the customer. It is no wonder that we are seeing such enthusiasm for this technology among retailers. The retail sector has been in transformation in the last decade with consolidations and mergers, rethinking merchandise strategies, new store formats, and consumers changing how and where they shop. Promotional pricing pressures, combined with an uncertain economy, have created a persistent shift to greater price-sensitivity among consumers. This has increased margin pressures on all but the highest-end luxury brands, driving the need to reduce costs on all fronts. There is a renewed interest therefore in lean principles and lowering inventory and labor costs wherever possible. However, inventory has to be reduced intelligently—across-the-board reductions only erode service levels, increase out-of-stocks, and thereby reduce sales. RFID decreases labor requirements. For example, RFID lowers the manual labor required for receiving by 50%-80%. 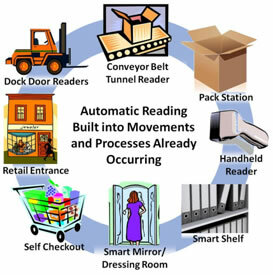 Inventory cycle counts can be done 10-30 times faster with RFID than current manual methods. Inventory accuracy is improved due to more frequent cycle counting and reduced counting errors. Improving inventory accuracy leads to improved replenishment and forecast accuracy, allowing retailers to intelligently lower inventory levels and at the same time reduce out-of-stocks. For luxury items, RFID is an important weapon in verifying authenticity. This requires strict security and control over the tags, as well as thinking through the supply chain and where in the chain authentication will be done. Further, it requires RFID tag designs that can be very discreetly integrated into the item, yet still perform well. Today, ultra-brands are educating their consumers and building out the systems and infrastructure for distributors, retailers, and end consumers to verify the authenticity of the item using RFID, often combined with other techniques. Luxury brands such as Burberry, de Grisogono, Elie Tahari, Ralph Lauren and others are using RFID to protect their brands and confirm authenticity. With intense competition coming from all sides—Amazon and other online channels, Big Box discount chains, and new market entrants encroaching on others’ territories—it is more important than ever for retailers to differentiate themselves and provide a unique customer experience. RFID can play a key role here with innovations such as automated/instant self-checkout, easier and more automated returns process, ensuring that the right mix is always in stock, freeing up store associate labor (from mundane tasks like stock keeping) so they can have more face-time with the customers, and enabling associates to give rapid, precise and high-confidence answers about what is in stock and where it is. 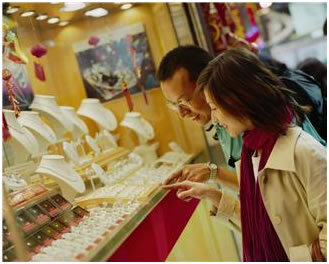 In fact, creative retailers discover new uses for RFID every day to transform the customer experience. In part 2 of this series, we will look at how the power of RFID is found in the end-to-end implementation across the supply chain. Download the full report here: The Explosion of Retail Item-Level RFID: a Foundation for the Retail Revolution, from which this series is excerpted.